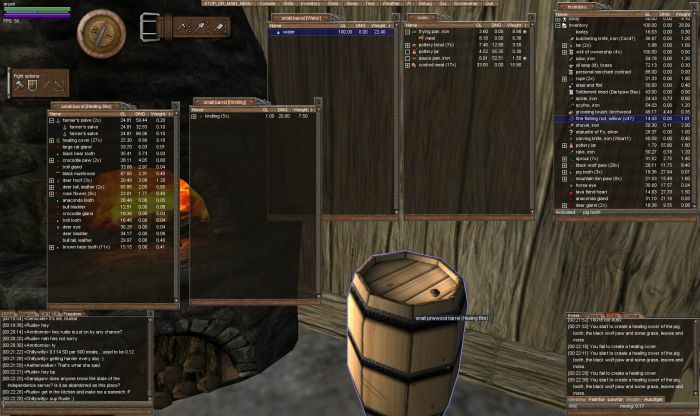 The Alchemist In Me #WurmOnline – Nomadic Gamers, eh! There’s one more incredibly handy skill that Fo priests are allowed to do that other priests are not able to perform. This is the alchemy skill. I’m not quite sure why it’s removed from other priests, but I’m very thankful that Fo priests can still make healing covers and dye. Lately I’ve been working on this skill in the hopes that I can make my dye stronger colours. Not that there’s anything wrong with the colours I’ve been making, but brighter is always nice. To make healing covers you combine 2 bits of animal parts together along with some grass, leaves, and moss. The only bits you need to physically have are the two animal parts (handy chart on the wiki on what you can use). So while I write this blog post, my character in game is busy combining deer glands with black wolf paws. Delicious n’est pas? In the screen shot above, the list on the far left hand side is a barrel I have currently holding all of my alchemy supplies. The tab beside that contains kindling, then water, then the contents of my oven (I had a meal and some meat cooking) and then finally my inventory. I’m trying to use up supplies that are decaying first. I’ve made 35 healing covers so far, which is not a large amount. I still have a huge amount of supplies to work through. I find these tasks incredibly relaxing. I can queue 3 actions at once, work on the 2nd monitor and easily go back to the game when it’s time to queue three more actions. I’m in the safety of my house so I’m not worried about being ambushed by creatures, and I’ve got food and drink with me in case they run low while I’m crafting. The only thing that stops me at this point in time, is when I run out of supplies (which is bound to happen sooner or later). I’ve managed to reach 25 in my animal husbandry skill, this allows me to see one more trait on the list of traits. None of my horses (or cattle, or deer) have the trait that is related to this skill level, but it’s nice to know that if they did have it, I’d be able to see it. Did you know you can use 0.01 of a horse eye combined with a black wolf paw to make a healing cover? Turns out that’s what I just made. As Arkenor and I are always saying in game, waste not, want not. There’s nothing that goes to waste in this game, it can all be used for something, even if it’s just a sacrifice to my deity for favor. I enjoy that aspect of Wurm, and I’m pleased that I’m now into my second month of playing with no sign of me wanting to stop any time soon – although I will admit, EVE has been calling my name pretty hard lately. I got an email about a 3 month deal for $30, and I may just take advantage of it. Maybe. As always, happy gaming, no matter where you find yourself! I always travel with about 20 healing covers, and those are all made from glands and teeth. These are high potency ingredients (4 out of 5) so the final result is a 20 potency healing cover (max = 25) which will heal anything. The added benefit is each one only weghs 0.02 while most other ingredients (barring eyes) are considerably heavier.